Currently, 2-km spatial resolution ETo image data are available from March 8, 2010, through yesterday. Harmsen, E. W., J. Mecikalski, M. J. Cardona-Soto, A. Rojas Gonzalez and R. Vasquez, 2009. Estimating daily evapotranspiration in Puerto Rico using satellite remote sensing. WSEAS Transactions on Environment and Development. Vol. 6(5):456-465. 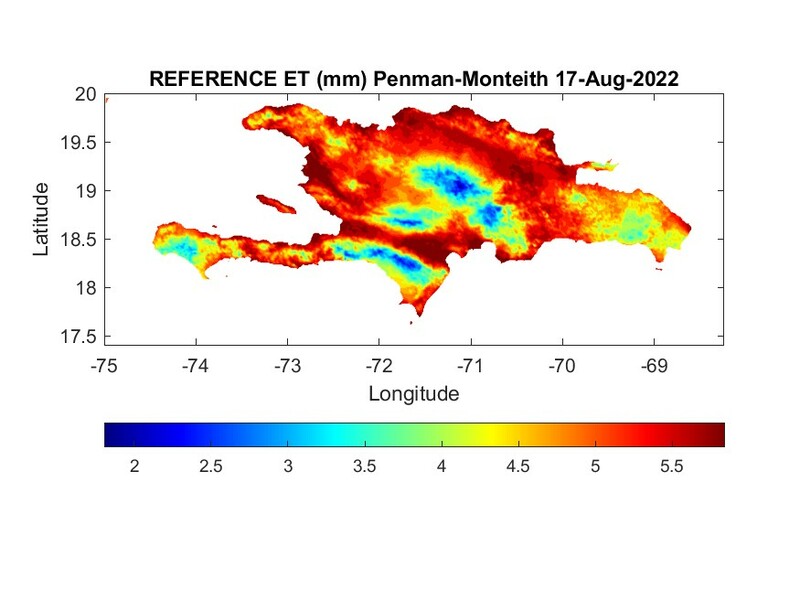 Example reference evapotranspiration (ETo) results for three methods and GOES Satellite-derived solar radiation for the island of Hispaniola, July 29, 2013. 1. Wind speed at a 2-m height is assumed to be the world-wide average of 2 m/s, recommended by the United Nations Food and Agriculture Organization: FAO Irrigation and Drainage Paper No. 56. 2. Average, minimum and maximum daily air temperatures are estimated using a lapse rate approached developed for Puerto Rico (Goyal et al., 1988). 3. The dew point temperature (used to estimate the actual vapor pressure) is assumed to be equal to the daily minimum temperature (Allen et al., 1998). 4. Solar radiation (the most important variable in the ETo calculation) is derived from a physical model for estimating incident solar radiation at the surface from GOES satellite data, first proposed by Gautier et al. (1980) (see also Diak et al. 1996; Okin et al. 2005; and Sumner et al., 2008). The ground level, 2-km resolution solar radiation product became available for the Northern Caribbean Region in March of 2010. At the following link a simple methodology is presented for scheduling irrigation, which can be applied to the DR and Haiti to save water, fuel and money: Simple web-based irrigation scheduling procedure. See also the following presentation which illustrates the procedure through a specific example problem: An Agricultural Application of GOES-PRWEB . Diak, G. R., W.L. Bland, and J. Mecikalski, 1996: A note on first estimates of surface insolation from GOES-8 visible satellite data. Agric. For. Meteorol., 82, 219-226. Gautier, C., G. R. Diak, and S. Masse, 1980: A simple physical model to estimate incident solar radiation at the surface from GOES satellite data. J. Appl. Meteor.,19, 1007–1012. Goyal, M. R., E. A. González, C. Chao de Báez, 1988. Temperature versus elevation relationships for Puerto Rico. J. Agric. UPR 72(3):449-67. Harmsen, E. W., J. Mecikalski, A. Mercado and P. Tosado Cruz, 2010. Estimating evapotranspiration in the Caribbean Region using satellite remote sensing. Proceedings of the AWRA Summer Specialty Conference, Tropical Hydrology and Sustainable Water Resources in a Changing Climate. San Juan, Puerto Rico. August 30-September 1, 2010. Otkin, A. J., M. C. Anerso, J. R. Mecikalski and G. R. Diak, 2005. Validation of GOES-Based Insolation Estimates Using Data from the U.S. Climate Reference Network. J. of Hydrometeorology, Vol. 6, August:460-475. Sumner, D. M, C. S. Pathak, J. R. Mecikalski, S. fJ. Paech, Q. Wu, and T. Sangoyomi, 2008. Calibration of GOES-derived Solar Radiation Data Using Network of Surface Measurements in Florida, USA. Proceedings of the ASCE World Environmental and Water Resources Congress 2008 Ahupua’a. ACKNOWLEDGEMENTS: This research received partial funding from the following sources: NOAA-CREST (grant NA06OAR4810162) and USDA Hatch Project (Hatch-402). Special thanks to Dr. John Mecikalski for providing the solar radiation data, and Alejandra Rojas for providing various GIS maps used in this research. I would like to thank my student, Victor Reventos, who made this possible through his Python programming skills.